Today just eight people have the same wealth as 3.6 billion of the world’s poorest and most vulnerable. It’s actually not even “people” anymore, as these fortunate few are all men. Oxfam told you last year it was 62 people who had all these spoils and now we’re telling you it’s eight men. This isn’t Oxfam being bombastic: the latest data on global wealth distribution signals that the poorest half of the world has less wealth than previously thought. If we’d had these figures last year, instead of 62 people the number would’ve been nine – nine men. The impact of this gap between the fortunate few and the rest of us is felt everywhere, but especially by the forgotten poorest. And yes, you guessed it: the majority of poor people are women. While eight men’s wealth is today the equivalent to that of 3.6 billion people, one in nine go to bed hungry every night. The super-rich are accumulating wealth at such a rapid rate that the world could see its first trillionaire in a mere 25 years, yet 1 in 10 of us still earns less than $2 a day. This is much more than a numbers game: these are the hallmarks of an economic system that has forgotten about people and is strangling the prospects of a better, fairer, more prosperous future for us all. Released to mark the World Economic Forum Annual Meeting 2017 in Davos, Oxfam’s latest inequality report exposes the workings of this deeply unjust economy and offers solutions to rebalance it. It describes how big corporations, headed by the super-rich and courted by governments, are dodging taxes, driving down wages, cutting prices paid to producers and investing less in their business to maximize returns for wealthy shareholders. Our political leaders seem beholden to the interests of these fortunate few, while there are many examples of the super-rich elites being driven by self-interest and profit at any cost. Wealth does not trickle down to the poor. 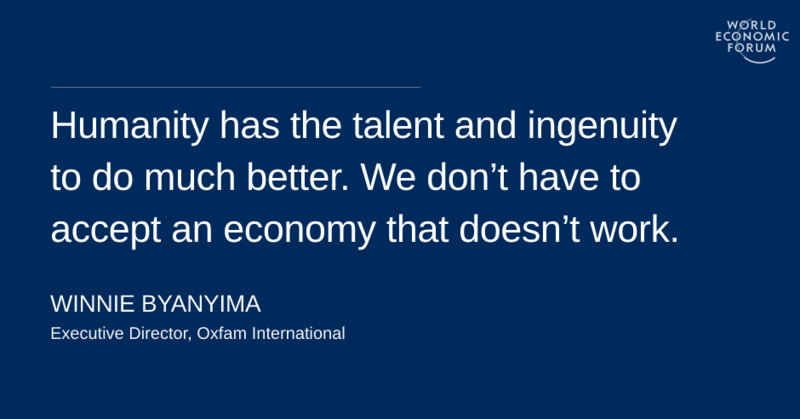 Oxfam knows this, the IMF knows this, the World Bank knows this. Poor people have always known this. But when governments chase GDP-growth at all costs, they are promoting an exclusive economy robbing hundreds of millions of people stricken by poverty, illness, exploitative work and destitution. Nor are the spoils of the world’s wealthiest down to just hard work. There is little evidence of meritocracy in today’s playground for the rich. More than half the world’s billionaires either inherited their wealth or accumulated it through industries prone to corruption and cronyism. The good news is it doesn’t have to be this way. Bold, sensible and practical solutions exist to right these wrongs. Having an economy that works for the 99% is achievable. It’s long overdue and, arguably, the need for it is what shook up politics last year. From Brexit and the election wins for Trump and Duterte, to South Africa’s ANC stronghold losses: the masses are speaking out in frustration. We need to break this cycle for the benefit of humanity. There will be more than enough to go around if we have an economy that works for everyone and not just the fortunate few. But if we continue with the current trend, we could undermine the work done to eradicate poverty, while living in an increasingly unstable and violent world where some – poor people, women – are seen as less valuable than others. This year’s World Economic Forum is focused on responsible and responsive leadership. Governments lead, but so do the super-rich, many of whom are gathering in Davos. Together they have a pivotal role to play in creating a world where we can all be fortunate and not just the few. Yes, that does mean redistribution. Governments should end the extreme concentration of wealth in order to end poverty. This means tackling tax dodging, but also increasing taxes on wealth and high incomes to ensure a more level playing field and generate the billions of dollars needed to invest in healthcare, education and job creation. But redistribution will not be enough – it is only ever a sticking plaster. We need fundamental change to our economic model. Governments must stop hiding behind ideas of market forces and technological change. They need to lead our economies by actively supporting businesses prioritizing social impact, intentionally steer the direction of technological development, confidently regulate markets and have the vision to cooperate to prevent a race to the bottom on wages and corporate taxation. Humanity has the talent and ingenuity to do much better. We don’t have to accept an economy that doesn’t work just because some people have got rich in the status quo. That is not democracy. Putting people first is possible – and it makes economic sense. The solutions exist to create a world where everyone is fortunate and no one is forgotten.